CartONG and its partner Les Petits Débrouillards have been implementing for nearly a year a project to raise awareness about Sustainable Development Goals (SDGs) throughout the Auvergne-Rhône-Alpes region, called "EducAuRA". This initiative is part of the "Frame, Voice, Report!" program, a European fund for civil society organisations which aims to strengthen citizens' knowledge about, and commitment towards the SDGs. As part of this project, CartONG created a map exhibition on the topic of migration entitled "When maps speak to us". Exhibited twice at the end of 2018, at the occasion of the GeOnG Forum in October and of the 2018 edition of the Festival des Solidarités in November, we wanted to give you the opportunity to (re)discover this interesting mapping project via our website. Indeed, this exhibition aims to deconstruct myths about the contemporary migratory context using a tool that is both silent and yet very meaningful: the map. A support used for the visualization of objective and standardized data, the map is used here to illustrate or denounce a few common beliefs about migration, thus trying to bring elements of comprehension on the origin and destination of the current international migratory flows, the main territories welcoming migrant people, and the profile of migrants around the world. The four maps exhibited below thus aim at questioning our perception of modern global migratory phenomena. Click on the maps to discover them in large format! Maps 1 & 2 - Europe: land of asylum? Europe in general, and France in particular, are not the territories hosting the largest number of migrant people. Moreover, it seems extremely complicated to speak of a "European dynamic" on migration issues, when we know that many disparities and deep disagreements exist between Member States. 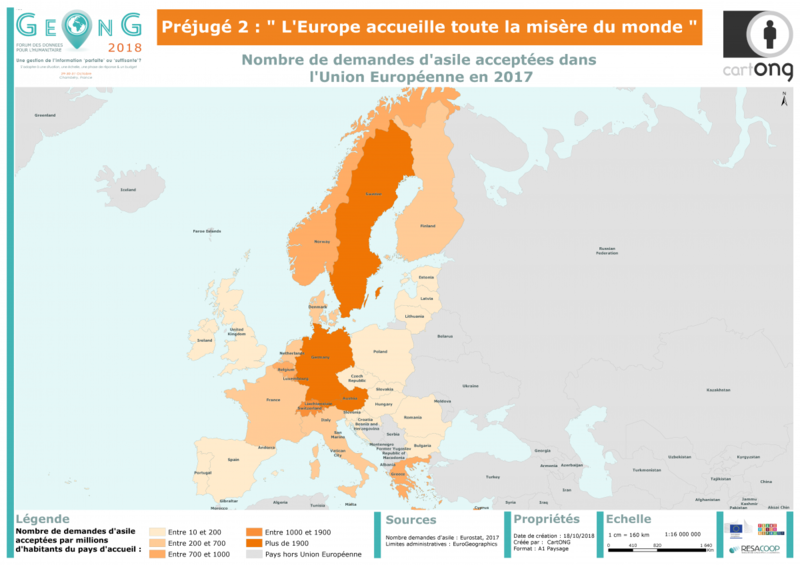 In 2016, 1.2 million asylum applications were registered in the 28 Member States of the European Union, equivalent to only 0.2% of the 508 million inhabitants of the European Union (Germany accounting for 62% of applications alone). The reality is thus quite different from the common belief: people fleeing their country because of a crisis most often seek asylum in a nearby country: Syrians in Turkey and Lebanon, Afghans in Pakistan and Iran, etc. According to UNHCR, nearly 9 out of 10 refugees took refuge in a "poor" or developing countries in 2015, primarily in areas close to the original crisis area such as Turkey, Lebanon, Iran, Pakistan or Jordan. In 40 years, the number of displaced persons in the broad sense of the term (labor migration, refugee displacement, student migration, etc.) has tripled and therefore the profile of host countries - in this context of globalized migration - tends to get blurred: countries of departure become host and transit countries, and vice versa. The idea that the most frequent displacements are the ones of nationals coming from developing countries and going to the richest ones is therefore far from accurate: globally, a third of migrants move from developing countries (South) to developed ones (North); one third, from South to South; and the last third from North to North. This situation is actually not really recent: in 2015, the World Bank was already asserting that the majority of international migratory flows took place between countries of the same level of development, especially between neighboring countries, or even internally i.e. within the same country. Map 4 - Men, women and children: who are "the migrants"? The profile of migrants (in the broad sense of the term) is not limited to a gender or an age, it reflects the various reasons explaining why people decide to migrate or flee. According to a 2016 UNICEF estimate, 50 million children do not live where they were born. Out of these, 28 million (11 million refugees and 17 million internally displaced people) reportedly fled due to conflict. Separated from their families to flee violence, poverty or the disastrous consequences of climate change, these children have to cross dangerous territories: 28% of victims of trafficking in the world are children; and minors from sub-Saharan Africa, Central America and the Caribbean are the most affected by this challenging reality. Who are these people on the road? They are minors, women (in 2015, about 50% of the world's migrant population were women and girls) and single men, but also elderly people, people with disabilities, whole families, all considered "vulnerable" as per the UN High Commissioner for Refugees' definition. The diversity of these vulnerable people is still largely overlooked in the maps about migration. This exhibition was made possible thanks to 3 CartONG dedicated volunteers, Michel, Ignacio and Pierre who we would like to thank once again, and who were supported by several CartONG staff. The EducAuRA project will come to an end in June 2019. Until then, join us for more events and activities: conference about gender equality (SDG 5) organised in Lyon in April, awareness-raising activity organised during the 2019 World Water Day, etc.